The way I’ve tried to describe this theme is that Oxford used the poetical lines of the Sonnets to create a double image, one in which, for example, “beauty” can mean everything it has always meant, and more, while simultaneously referring to Queen Elizabeth and/or her royal blood. Both images are at work and we need not eliminate one at the expense of the other. One thing that intrigues me about this concept is that there’s nothing secret about “beauty” referring to the Queen; rather, we have been told over and over for at least a century and a half that the word “beauty” is to be taken literally, and only on the literal level, as referring to “the quality present in a thing or person that gives intense pleasure or deep satisfaction to the mind,” as my Random House Dictionary puts it. Could it be that “beauty’s Rose” in Sonnet 1 signifies not only a flower but, also, the Queen’s dynasty of the Tudor Rose? Could it be that “ever the same” in Sonnet 76 signifies not only what it usually means, but, also, Queen Elizabeth, given that “Ever the Same” was how Her Majesty herself wrote her motto Semper Eadem in English on her correspondence? Of course it could be so. Furthermore, if the poet was Edward de Vere, who had enjoyed the highest favor of Elizabeth at the royal court, it could not have been otherwise; that is, the Earl of Oxford could not have written “ever the same” without deliberately referring to the Queen. I am continuing to enjoy Professor Gontar’s various essays, which are written with great care, precision and depth; and I highly recommend his book, especially to readers who like being surprised by new insights. 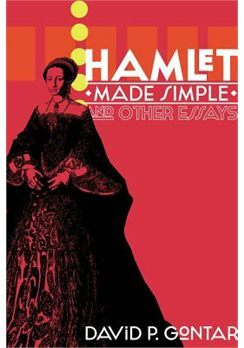 I can say this already — after reading his title essay “Hamlet Made Simple,” I will never be able to view that great play in the same way as before; my conception of what’s going on in Hamlet has been forever altered.